Book by December 4 to save up to 30%. SPG® Members save 5% more, earn Starpoints® and get free in-room Internet. Valid for stays through September 4, 2017. • Offer is valid at participating Starwood Hotels & Resorts only. Click here for a list of participating properties. • Savings up to 30% off the flexible rates. SPG Members save an additional 5%. Discount varies by property and can range from 10% to 35% or more, based on availability. • In order to be eligible for SPG® Member rates (rate plan SPGDI), guests must be an active member in good standing of the Starwood Preferred Guest program. Guests who are not SPG members may join the free program online at www.spg.com or at time of booking. • Offer valid for bookings made November 21 – December 4, 2016 and valid for stays November 21, 2016 through September 4, 2017. • Arrival day and length of stay restrictions may vary by property. • Advance purchase required. Credit card will be charged at time of booking. • Cancellations are non-refundable; if cancellation takes place, guests forfeit total room charge plus tax. 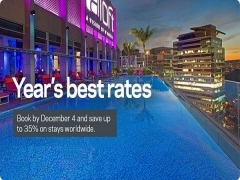 Checkout Starwood Hotels for more details about this offer and to book your accommodation now!